Scripture teaches us heaven and hell do exist,and it is confirmed in the story of lazarus and the rich man.Lazarus who was a beggar desired to be fed from the rich mans table as he laid at his gate full of sores.We learn how the beggar was carried to Abrahams bosom while the rich man ended up in hell and in torment (Luke 16:19-25). 19 There was a certain rich man, which was clothed in purple and fine linen, and fared sumptuously every day:20 And there was a certain beggar named Lazarus, which was laid at his gate, full of sores,21 And desiring to be fed with the crumbs which fell from the rich man’s table: moreover the dogs came and licked his sores.22 And it came to pass, that the beggar died, and was carried by the angels into Abraham’s bosom: the rich man also died, and was buried;23 And in hell he lift up his eyes, being in torments, and seeth Abraham afar off, and Lazarus in his bosom.24 And he cried and said, Father Abraham, have mercy on me, and send Lazarus, that he may dip the tip of his finger in water, and cool my tongue; for I am tormented in this flame.25 But Abraham said, Son, remember that thou in thy lifetime receivedst thy good things, and likewise Lazarus evil things: but now he is comforted, and thou art tormented. Another good confirmation for us that hell exists is found in the revelation of the white throne judgment,a time when the dead small and great stand before God including death and hell deliver up the dead that were in them! (Revelation 20:11-15). 11 And I saw a great white throne, and him that sat on it, from whose face the earth and the heaven fled away; and there was found no place for them.12 And I saw the dead, small and great, stand before God; and the books were opened: and another book was opened, which is the book of life: and the dead were judged out of those things which were written in the books, according to their works.13 And the sea gave up the dead which were in it; and death and hell delivered up the dead which were in them: and they were judged every man according to their works.14 And death and hell were cast into the lake of fire. This is the second death.15 And whosoever was not found written in the book of life was cast into the lake of fire. Such a GOOD post and SO needed these days; most people only hear about “hell” as an angry expletive when they are around someone who becomes frustrated or angry ! 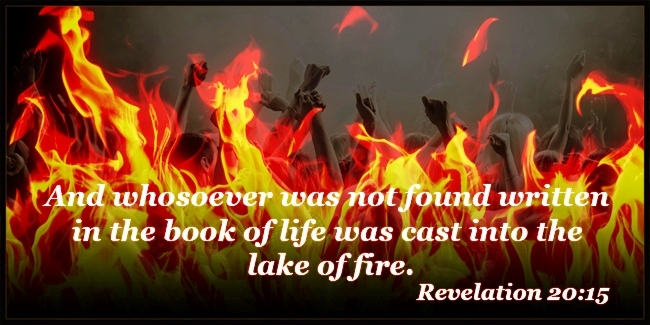 WHY have preachers and ministers STOPPED preaching about “HELL” and the “LAKE of FIRE” from the pulpit ? I can truthfully say that I have not heard any minister make more than a hasty mention of HELL and I don’t think ANYONE has ever mentioned the LAKE of FIRE and the SECOND DEATH in their sermons and messages. Because of this, there is NO fear of GOD in the land. There are REASONS why Judgment MUST BEGIN at the House of GOD, isn’t there ? Although I haven’t been on the internet much recently, I do appreciate your lifting up of the Word of GOD. It is the ONLY WRITING that carries the Promise: It shall not return VOID but will accomplish the work HE+ sends it to do ! Praise GOD for that! May The LORD richly bless your work and labor of love for HIM+, JESUS CHRIST the LORD.